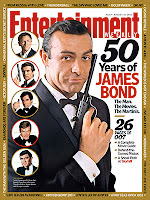 By now you probably know that the new issue of Entertainment Weekly magazine has special James Bond 50th Anniversary coverage as well as a peek at the new film Skyfall. Nothing literary Bond related and no mention of Fleming anywhere, unfortunately, but there is a nice shot of Timothy Dalton from his 1986 screen test that I've never seen. 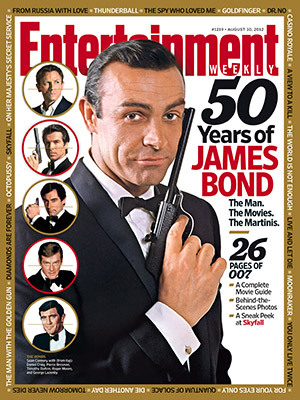 Here's a look back at past Entertainment Weekly Bond covers, including their fantasy covers that came inside the Fall Movie Preview issue of 2006 (love these). 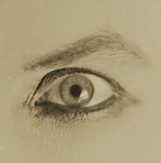 Gotta love the Dalton (1987) cover. The Simpsons should get their own show! E-mail forwards are the future of comedy! Is Madonna over? Pity that of the four things on this cover Dalton as Bond was the one that wouldn't last. Great stuff, love the Dalton cover too. Yep, I pointed that out in the last paragraph. Can you print or send a link to the Dalton screen test photo for those of us in the UK who can't get EW magazine? I was under the impression he didn't do one, that Cubby knew he could play the part. Check out this post at CBn. 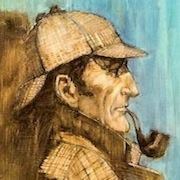 There's a link to the pic there.